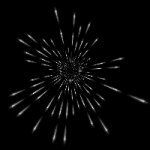 This tutorial shows how to quickly create some fireworks (and a few other effects) with Gimp, that you could easily be reused. Let's start by creating a new image (with a size of 800*600 at least, to have enough space ;) ) and fill it with black. On the menu, select Filters > Light and Shadow > GFlare. In general this effect is used to fake lens flare effects on photos etc. Here, we are going to customize the flare effect to make it look like an exploding firework. On the GFlare window, click on New, et name the new flare "Firework". Then click on the Edit button. The Gflare edit window appears. There you can see that the flare is made of several parts : a Glow, Rays, and Second Flares. The glow is the big red spot in the center, the second flares are the smaller white spots, and the rays ... are the white/black rays ;) that can be seen on the image below. We won't use the glow and the second flares here. Click on their tabs, and for each, set the "Size(%)" value to 0, to remove them. Now go on the Rays tab. To understand how the rays are made, set the 3 gradient parameters to "%white". The rays are now all the same. 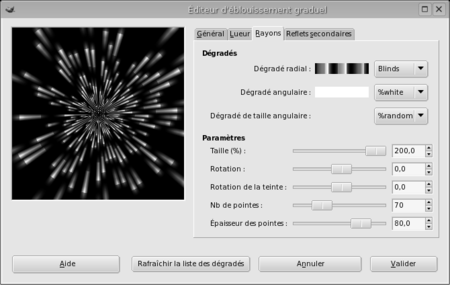 The Radial Gradient parameter, as its name describe it, is used to apply a radial gradient on the rays. Choose for example "Abstract 1" to see how it looks like. 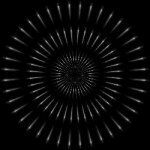 TheAngular Gradient parameter is used to apply a conical/angular gradient to the rays. At the moment, the rays are continuous. To make them looks like sparkles, we have to choose the right Radial Gradient. Among the available gradients, choose the one called "Blinds". All the gradients based on an alternation of dark and light color work fine for this ("Four Bars", "Three Bars Sin", "Shadows1", "Flare Glow Radial 4", etc ...) The best solution is to test them all :). Now we have some kind of sparkles, but they are set out in a much too regular way. Set the Angular Size Gradient to the "%random" value. The sparkles are now scattered, as their size is set with a random gradient. You could also set the Angular Gradient to the "%random" value, or keep it to "%white", or set it to any other gradient that you like. It's almost finished. We only have to adjust the parameters on the bottom of the editor. Set the number of Rays ("# of spikes") to what you think will suit the best. Set their thickness the same way (around 80, it gives good results), as well as the size of the fireworks (set it to 200% to have something big enough). The Rotation is'nt important here, because we use random gradients. In the same way, the " Hue Rotation" parameter is used only if a colored gradient was set as Radial Gradient. Validate. The fireworks are ready to be added in the image. On the preview window, click where you want your firework to be, and validate. To add some more fireworks in the image, all you have to do is to re-open the GFlare window, select the "fireworks" flare, and clic somewhere else on the preview. If you followed my settings, you should now have some (dull) white fireworks. Add a new transparent layer to the image, and set it to the Overlay mode (other modes may work too). You can now fill it with the colors you like, and the colors will show on the fireworks. For example, I used the 3 first effects above to make some of the sparkles brushes. On the Rays tab, and/or the Glow tab: You have to use gradients with colors that are repeated 4 times, such as the "Four Bars" gradient, and apply it to the Angular Size Gradient, and/or to the Angular Gradient. It will create a flare in the shape of an "X". Apply a 45° rotation if you want it to be in the shape of a "+". For this, it's better to have a number of rays multiple of 4. You can choose any Radial Gradient you wish. 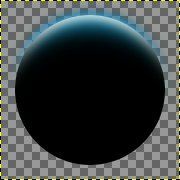 On the Rays tab and/or the Glow tab: You have to use a gradient from light to dark, such as the "%blue_grad" gradient, and apply it to the Angular Size Gradient. You can set the other gradients as you wish. For the 1st star: A Glow with a size of 50%, "%red_grad" as Radial Gradient, "%white" as Angular Gradient, "Four Bars" as Angular Size Gradient, and a 45° rotation. Rays with a size of 130%, "Flare Radial 101" as Radial Gradient, "%white" as Angular Gradient, "Four Bars" as Angular Size Gradient, a 45° rotation, 20 spikes, and a spike thickness of 68. For the yellow seashell: A Glow with a size of 100%, "Three Bars Sin" as Radial Gradient, "Yellow Orange" as Angular Gradient, and "%blue_grad" as Angular Size Gradient. Rays with a size of 100%, "Crown Molding" as Radial Gradient, "Yellow Orange" as Angular Gradient, "%blue_grad" as Angular Size Gradient, 40 spikes with a thickness of 78. I let you find the settings for the other effects by yourself. 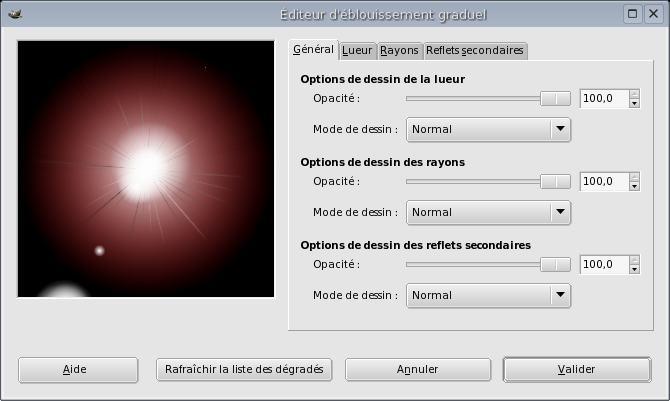 Once you have understood how the creation of GFlare works, it's easy to create a lot of new flare effects. The above effects were all made using the default gradients that come with the Gimp, but it could be interesting to create your own gradients to have even more creation possibilities. Tutoriels, GIMP et Blender, en français & anglais. GIMP and Blender tutorials, in French and English.